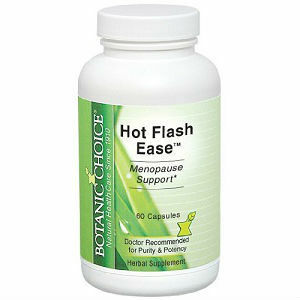 Botanic Choice Hot Flash Ease is made using standardized herbal extract that help manage menopause and provide women with the six traditional nutrients. Hot Flash Ease brings relief from hot flashes, night sweats, mood swings, fatigue, sleeplessness and irritability. It also supports memory. Soylife Soy Germ Extract – Contains isoflavones, which are phytoestrogens. These mimic the characteristics of estrogen and reduce the symptoms of menopause. Also keep the heart healthy. Black Cohosh extract – Relieves sleeplessness and anxiety. Chasteberry extract – Contains aucubin which helps reduce occurrence of hot flashes. Gingko biloba extract – Boosts mood and enhances memory. Red clover extract – Another source of estrogen-like isoflavones. Reduce hot flashes and other menopause symptoms. Commonly used to maintain women health. Suggested daily dosage is 2 capsules. While the ingredients are all natural and safe to use, the supplement contains soybeans and may cause allergic reaction in some people. While the listed price per bottle is $39.99, the website sells the product at a discounted price of $19 per bottle. Each additional bottle comes at an even lower rate of $17 each. This is quite a reasonable price to pay per month and is cheaper than other supplements in this category. The company offers a no-questions-asked 100% refund policy and if you are unhappy with the quality, potency or effectiveness of the supplement for any reason, you can return the unused portion and get your money back. This is a good product that contains natural ingredients. It is reasonably priced and is backed by the company’s money-back guarantee. Jackie Horowitz	reviewed Botanic Choice Hot Flash Ease	on November 26th	 and gave it a rating of 3.